The third highest mountain in the world, Kanchenjunga lies in the eastern Himalaya of Nepal on the border of Nepal and Sikkim. The main part of this mountain is an enormous mass with many different peaks surrounding it which arise from its narrow icy ridges. So, there are in fact four summits namely Main Summit, Middle Summit, South Summit & Yalung Kang or West Summit. 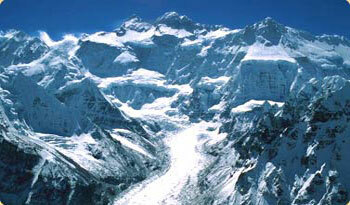 The first successful climb was in 1955 by a British Expedition team. The mountain lies in the Kanchenjunga Conservation Area Project which is funded and run jointly by the World Wildlife Fund and the Government of Nepal. The Kanchenjunga area is a rich home to many rare species of flora and fauna including the red panda. Three of Kanchenjungha’s five peaks the main summit, central summit and south summit lie directly on the border between Nepal and Sikkim, India while the other two peaks lie completely in the Taplejung District of Nepal. The Yalung Kang 8420m also known as West summit is considered by some mountaineers to be a separate summit. The safest route is a climb up the North Face due to the prevailing weather conditions but it is not the easiest. Base camp is at an altitude of 5,180 m which is the start point for the climb. Day 02: This day is spent on Preparation for the journey to come. Day 04: Trek from Taplejung to Mitlung. Day 05: Trek from Mitlung to Chirwa. Day 06: Trek from Chirwa to Sekhatum. Day 07: Trek from Sekhatum to Amjilesa. Day 08: Trek from Amjilesa to Gyabla. Day 09: Trek from Gyabla to Ghunsa. Day 10: Trek from Ghunsa to Khambachen. Day 11: Trek from Khambachen to Lhonak. Day 12: Trek from Lhonak to Pang Pema. Day 13: Trek from Pang Pema to Kanchenjunga Base Camp. Day 39: Trek from Selely to Mirgin La to Tseram. Day 40: Trek from Mirgin La -Tseram to Oktang-Torotan. Day 43: Trek from Mamanke to Bhanjyang. Day 44: Trek from Bhanjyang to Lali Kharka. Day 45: Trek from Lali Kharka to Suketar. Day 46: Fly from Suketar to Kathmandu. Day 47: Rest day in Kathmandu. Day 48: Transfer to airport for your onward destination.